As I begin preparing for another trip (countdown has begun for when I will get to hear a certain Four roll her Italian Rrrrs in person rather than on a Facetime screen), I realize how much I still have to share from my last one. 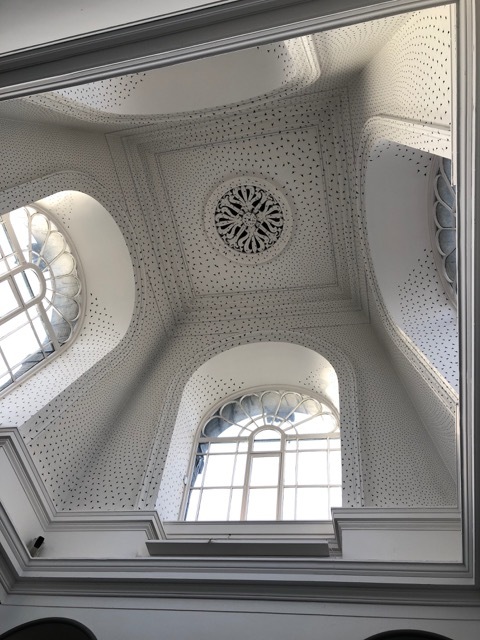 Richard Wright's intricate, mesmerising, wonderfully delicate and monumental at once, Stairwell Project in the Scottish National Gallery of Modern Art (in Modern Two, which used to be an orphanage, the Dean Orphan Hospital), for example. 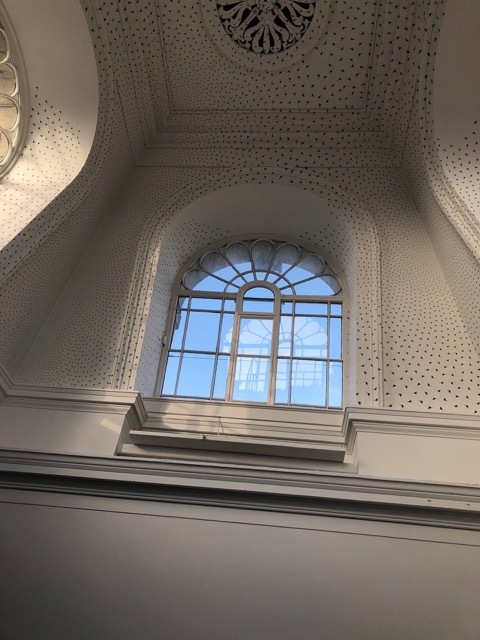 The work was commissioned several years ago with the intention that it be a permanent rather than temporary feature of the gallery, although Wright, who usually paints on walls rather than canvases, also usually has those walls painted over at the end of an exhibition. 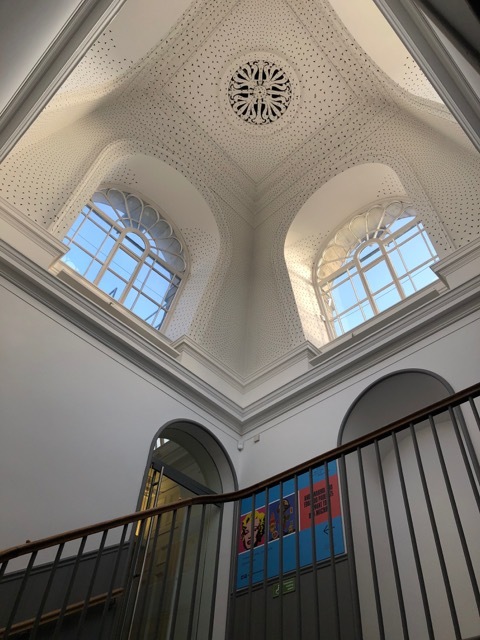 In the gallery's leaflet on The Stairwell Project, Chief Curator Keith Hartley observes that we "tend to forget" that, within the tradition of western art, decorative painting of walls and ceilings was a common practice. He traces the development from an expectation that art be utilitarian, to the patronage of artists by aristocracy which began in the Renaissance, and then to the changing expectation which led to an individual artist dependent on the market. The role of the marketplace, Hartley argues, had by the 1980s led to "almost a feeding frenzy for expressive, largely figurative painting," and this "climate of greed" alienated Wright. As Hartley quotes the artist, from a 2000 interview: "About ten years ago I began working in what for me was a new way. 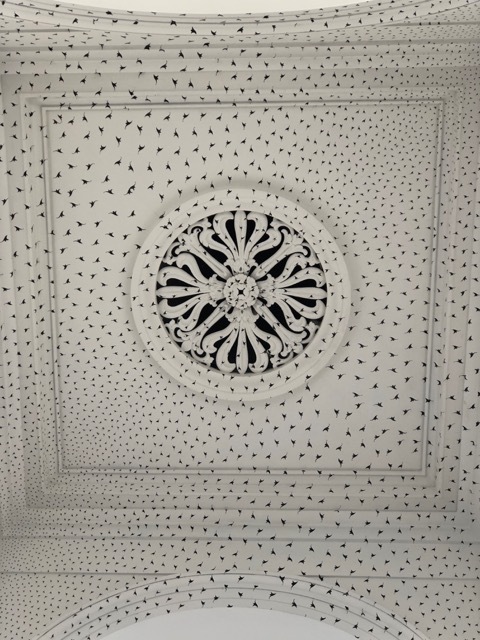 This seemed to have something to do with the action of painting and turned out to mean working directly on the wall, which in turn implied thinking about context and architecture as part of the content of the work." I'm tempted to copy the entire leaflet here for you, but Pater's suggested a paddle in my new kayak this morning, so instead I'm going to suggest you watch this fascinating video in which Wright speaks directly about the conception and execution of the work, pointing out that the whole thing is made of two small pots of paint. . . The video's only four minutes long, and besides telling you more about how and why The Stairwell Project was made, it gives you a much better sense of its scale and light and beauty than my photos can do. And speaking of light and beauty. . . a sunny day in Vancouver, and we're teased with the possibility of a High in the mid-teens (Celsius) today. Time for me to get out on the water. Your turn to chat now -- comments very welcome (and I do apologise for the difficulties you're having in posting. Some readers have suggested that using Chrome as your browser makes a difference; some find it possible to post from a laptop rather than their phone). Do not discount the value of Skype sessions. My mother babysat my kid (she in the U.S.; my kid in France) far more than my MIL ever did (I never, ever left my child alone even five minutes with that sadistic witch). My mom would suggest drawing something, and then she and my kid would hold up their work to the camera. If I dared to pop my head into (my) office, my kid would rebuke me, "We are BUSY here!" It would go on for more than an hour. I always regretted the distance but was grateful for the intense one-on-one attention of those skype sessions. This is good to hear, ToF, really encouraging -- although I find it tough to work around the 9-hour time difference, especially in combination with the (full-day) preschool schedule, and this particular grandchild doesn't love to sit still for long. Perhaps now that she's getting a little bit older. . . I have my own version of that same photo, the third one, on my phone from my trip to Scotland. Never posted, waiting somewhere in amorphous mental space. And thinking of light and space, I am in Texas, visiting my mom, at the end of my trip, and I have been savoring the difference in the light and the sense of space. There is something about the openness, the enormity of the sky and the way perspective seems endless, something in “big sky” country that always makes me feel simultaneously very small and very settled and at peace. Different than Scotland. Different than the Eastern United States. Wasn't it a wonderful space? I've spent very little time in Texas (airports and 3 days at a conference in San Antonion), but I think the Canadian prairies offer that same openness and sense of enormity. It doesn't make me feel settled and at peace, though -- having lived all my life on the coast, I tend to feel landlocked when I get too far inland. . . The photos are intriguing. I’m always fascinated by what artist choose to produce and why. Creative people seem to experience life differently. The medallion in the ceiling could be a design for a piece of jewellery. It's a beautiful medallion, yes. . . Thank you for the photos and the video link. Marvelous piece of work. My first thought upon viewing was that it reminded me of a murmuration. Fascinating though, to keep looking at it, and seeing different aspects the more you view it. Yes!! It suggested a murmuration to me as well! Yes, murmuration was my thought too. I always enjoy the quieter artworks - like this - that you chance upon rather than those which clamour for the attention. Isn't it funny, that it does seem to be a quieter artwork, despite the grandeur of its scale. . .
Glad you enjoyed those IG photos -- I was happy to be on the water again. For me too, is the haunting thought of orphanages. There was one in the city I grew up (in Edmonton). I used to see children playing behind the wired fence in an albeit beautiful old building, but the thought they didn't have parents for me as a child was a devastaing concept. Great photos. The logistics captivated me -- and I've loved reading a bit more about Wright's thoughts on the value of art in terms of the market as opposed to different kinds of value, his choice so often to keep his art ephemeral, temporary. This movement we see everywhere with public art and outdoor mural art. . . Yes, orphanages. We have some family history there. . .
What a beautiful space! Thanks so much for sharing it. You're very welcome -- I'm glad you enjoyed the post.